← Calling All Brave Souls! Parks Canada Interpretation Specialist, Wayne Kerr, will give a spirited presentation about his latest book entitled History Etched in Stone: Gravestone Art and the Garrison Graveyard at Annapolis Royal on Tuesday, November 1, 7:30 p.m. at St. Luke’s Anglican Church Hall in Annapolis Royal. 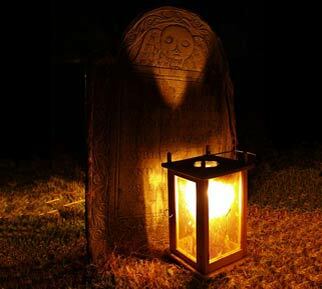 The Garrison Graveyard is located at Fort Anne National Historic Site and has been the site of The Historical Association of Annapolis Royal’s popular Candlelight Graveyard Tours since 1992. Annapolis Royal is one of the most fought-over pieces of land in Canada, and the Garrison Graveyard is the final resting place for hundreds of Acadian, French and British civilians and military personnel spanning over three centuries. With the oldest stone dating back to 1720, (29 years before Halifax became the capital of Nova Scotia), it is one of the oldest and most historic English graveyards in Canada. Don’t miss this extraordinary opportunity to learn about our national treasure first-hand from Wayne Kerr. This fun-filled evening is proudly sponsored by The Historical Association of Annapolis Royal. It is open to the public and is free of charge. This entry was posted in Explore Annapolis Royal, Heritage and tagged Acadian, Candlelight Graveyard Tours, Explore Annapolis Royal, Fort Anne, Garrison Graveyard, Historical Association of Annapolis Royal, Parks Canada, Wayne Kerr, What to see and Do, What's Happening. Bookmark the permalink.